You’re Looking at an Actual Image of a White Dwarf Feeding on Material from a Larger Red Giant, 650 Light Years from Earth. The SPHERE planet-hunting instrument on the European Southern Observatory’s Very Large Telescope captured this image of a white dwarf feeding on its companion star, a type of Red Giant called a Mira variable. Most stars exist in binary systems, and they spend an eternity serenely orbiting their common center of gravity. But something almost sinister is going on between these two. Astronomers at the ESO have been observing the pair for years and have uncovered what they call a “peculiar story.” The Red Giant is a Mira variable, meaning it’s near the end of its life, and it’s pulsing up to 1,000 times as bright as our Sun. Each time it pulses, its gaseous envelope expands, and the smaller White Dwarf strips material from the Red Giant. The world’s most powerful telescopes have a lot of work to do. They’re tasked with helping us unravel the mysteries of the universe, like dark matter and dark energy. They’re burdened with helping us find other habitable worlds that might host life. And they’re busy with a multitude of other tasks, like documenting the end of a star’s life, or keeping an eye on meteors that get too close to Earth. But sometimes, they have to take a break. Just to get you in the mood for the upcoming total solar eclipse — now less than two weeks away — our Solar System put on a little eclipse display of the lunar kind on August 7. The full Moon passed through part of the Earth’s umbral shadow, and the timing made this partial lunar eclipse visible in parts of Europe and Africa. Thanks to our friends around the world who posted in Universe Today’s Flickr page, we’ve got images to share! Enjoy the views! Click on all the images to see larger versions of them on Flickr. The lead image link is here. And for those of you in the path of the August 21 solar eclipse, please feel free to share your images on our Flickr page, and we may feature them in an upcoming article. A composite of images take during the August 2017 lunar eclipse, as see from Kuala Lumpur. Credit and copyright: Shahrin Ahmad. Partial lunar eclipse seen from Lausanne’s lakeshore in Switzerland … The Moon had just moved up from behind the Tour d’Aï Peaks. Credit and copyright: Hicham Dennaoui. Partial Eclipse of Moon over the Church of Our Lady of the Bell in Casarano, Sicily, Italy. 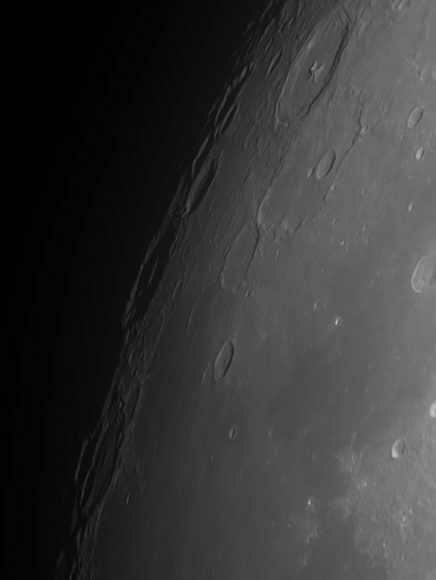 Single photo taken with a Konus 80/400 telescope and Canon 700d camera. Credit and copyright: Gianluca Belgrado. Eclipsed full moon over the eastern horizon as seen from Treppendorf, Brandenburg, Germany. Credit and copyright: Andreas Schnabel. A view of the partial lunar eclipse on August 7, 2017 as seen from Malta in the Mediterranean Sea. Credit and copyright: Leonard Ellul-Mercer. Now updated with more great images! Although there’s been quite a bit of hype about the Super Moon on November 13, 2016, to many, the full Moon tonight may have appeared quite similar to other full Moon’s you’ve seen. Yes, the “super-ness” of this Moon, while noteworthy, is fairly imperceptible. While, as our own David Dickinson noted in his preview article, this full Moon is not only the closest for the year, but the nearest Full Moon for a 80 year plus span. However, the closest full moon of 2017 will be only 0.02% farther away than this one. But any chance to get the public to look up at the night sky is a good one! And we’ll also take this opportunity to share some of the great images from around the world posted on Universe Today’s Flickr page, as well as on social media. Enjoy! The Moon just before full on November 13, 2016 imaged through cloud from London. Credit and copyright: Roger Hutchinson. Supermoon over Glastonbury Tor, Somerset, England on Nov. 13, 2016. Credit and copyright: Tim Graham/TJG Photography. The ‘Super Moon’ over Rome on November 14, 2016. Credit and copyright: Gianluca Masi. A view of the supermoon as seen from Lahore, Pakistan, with color added for contrast. Credit and copyright: Roshaan Bukhari. Moon and clouds as seen from the UK on Nov. 13, 2016. Credit and copyright: Sculptor Lil on Flickr. Pale Moon rising, as seen from North Bedfordshire, UK on Nov. 13, 2016. Credit and copyright: Dawn Sunrise on Flickr. Noted NASA photographer Bill Ingalls is in Russia for the next launch of astronauts to the International Space Station. He took this image from Baikonur, Kazakhstan and also provided some tips on photographing the Moon. Moonrise near Keene, Ontario on November 13, 2016. Credit and copyright: Rick Stankiewicz. 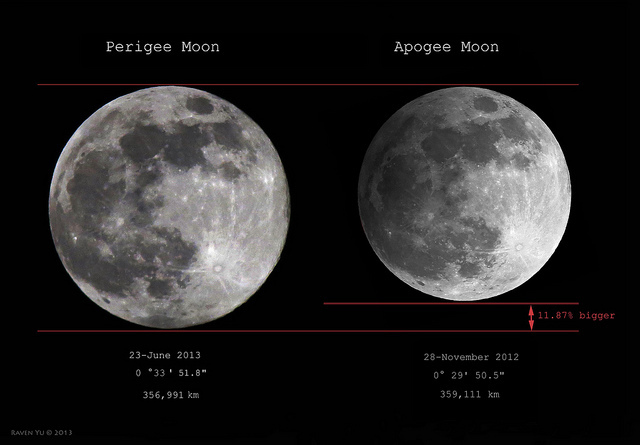 A perigee ‘Supermoon’ versus an apogee ‘Minimoon’. Image credit and copyright: Raven Yu. Thanks to everyone for sharing their images, and be sure to check out UT’s Flickr pool for the most recent shots. Link to the lead image by Owen Llewellyn can be found here. Obviously, you’ve seen timelapse videos of the night sky because we share them here on Universe Today all the time. But you’ve probably not seen a video like this one before. 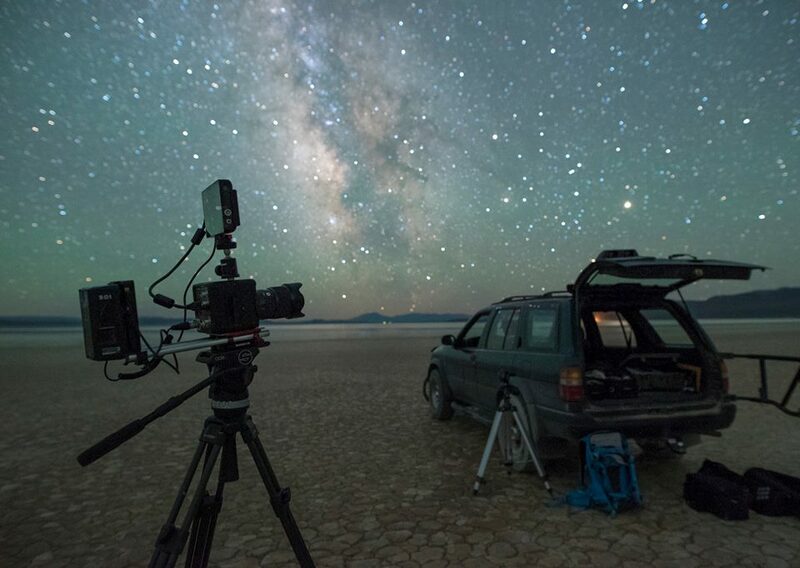 This one isn’t a timelapse, and you’ll see the night sky in all its splendor, in real time. Check out more on Uncage The Soul Productions, Canales’ astrophoto website and Facebook. Still image from the film Infinity². Image Courtesy Ben Canales. Still image from the film Infinity ². Image Courtesy Ben Canales. Infinity ² from Uncage the Soul Productions on Vimeo. The winners of the 7th annual Earth & Sky Photo Contest have been announced, and wow, these images are absolutely stunning! The contest really highlights the beauty of the night sky, and its mission is to spread the message to cut down on light pollution while helping to preserve the last remaining natural night environments and night skies in the world. The contest was organized by The World at Night (TWAN) and other sister organizations. The second place winner in the ‘Against the Light’ category is Carlo Zanandrea from Italy for “All that Glitters is not Gold” taken in December 2015 showing constellation Orion rising over lights and fog in the province of Treviso in northeastern Italy. Credit and copyright: Carlo Zanandrea. This photo, “Viking Lights” by Adam Woodworth from USA, won in the composite section of the ‘Beauty of the Night Sky’ category, where frames of various exposure or focus settings are blended. This image was captured in Newfoundland, Canada in June, 2015. Credit and copyright: Adam Woodworth. In the photo sequence submissions, the winner in the Beauty category is “Total Solar Eclipse from Svalbard” by Thanakrit Santikunaporn from Thailand. He captured the eclipse phases every 3 minutes over frozen landscape of Svalbard, Norway on March 20, 2015. Credit and copyright: Thanakrit Santikunaporn. The contest was open to anyone of any age, anywhere in the world; to both professional and amateur/hobby photographers. It has been an annual event since 2009 (initially for the International Year of Astronomy) by TWAN, the National Optical Astronomy Observatory, and Global Astronomy Month from Astronomers Without Borders. The contest supports efforts of the International Dark Sky Association (IDA) and other organizations that seek to preserve the night sky. The images were taken in 57 countries and territories including Algeria, Antarctica, Australia, Austria, Bahamas, Belgium, Bolivia, Brazil, Canada, China, Colombia, Croatia, Czech Republic, Egypt, England, Estonia, Finland, France, Germany, Greece, Guatemala, Guam, Hungary, Iceland, India, Indonesia, Iran, Ireland, Italy, Japan, Jordan, Kenya, Lithuania, Madagascar, Malaysia, Malta, Morocco, Norway, New Zealand, Paraguay, Peru, Philippines, Poland, Reunion (France), Romania, Russia, Scotland, Sri Lanka, South Africa, Spain, South Africa, Sri Lanka, Sweden, Switzerland, Tanzania, Thailand, Ukraine, and USA. See all the images and more information about them at TWAN. Click on each image for larger versions. A larger version of the lead image can be found here. You can see the global atlas of light pollution here, which was created from data from the NOAA/NASA Suomi National Polar-orbiting Partnership satellite and calibrated by thousands of ground observations. This article was written by contributing author Janik Alheit, and is used by permission from the original at PhotographingSpace.com. Learn how to shoot the Milky Way at PhotographingSpace.com! What do you get when you combine 15 radio telescopes on Earth and one in space? You get an enormous “virtual telescope” that is 63,000 miles across. And when you point it at a distant black hole, you get the highest resolution image every seen in astronomy. Although it looks just like a big green blob, it’s actually an enormously energetic jet of matter streaming out of a black hole. And this black hole is 900 million light years away. As reported at Popular Science, it required an array of 15 radio telescopes on Earth, and the Russian space telescope Spektr-R, to capture the image. This technique—called interferometry—is like creating a telescope that is 63,000 miles across. The detail it provides is like seeing a 50 cent coin on the Moon. For perspective, the object in the image is 186 billion miles long, at minimum, and would just barely fit in the Oort Cloud. The jet at the heart of BL Lacertae, with the Oort Cloud and Alpha Centauri for comparison. Image: Gomez et. al., A Lobanov, NRAO. Have you seen the views in the morning skies this week, with three planets huddling together at dawn? Just one degree separated planets Jupiter and Venus, with Mars sneaking in nearby. Astrophotographers were out in full force to capture the scene! Above, the very talented photographer Alan Dyer from Canada captured a stunning image of the planetary trio over Lake Annette, in Jasper National Park, Alberta, Canada. He took several gorgeous shots, and so we’ve added one more of his below, plus dozens of other wonderful shots from our astrophotographer friends around the world. Each of these images are from Universe Today’s Flickr pool, so you can click on each picture to get a larger view on Flickr. Enjoy these great views, as there won’t be a more compact arrangement of three planets again until January 10, 2021. A panorama of roughly 120° showing a star- and planet-filled sky in the dawn twilight over Lake Annette in Jasper National Park, Alberta, on the morning of October 25, 2015. At left, to the east, are the two bright planets, Venus (brightest) and Jupiter in a close conjunction 1° apart (and here almost merging into one glow), plus reddish Mars below them, all in Leo, with the bright star Regulus above them. Right of centre, to the south, is Orion and Canis Major, with the bright star Sirius low in the south. At upper right are the stars of Taurus, including Aldebaran and the Hyades star cluster. Venus was near greatest elongation on this morning. Credit and copyright: Alan Dyer. Taken from Coral Towers Observatory in Queensland, Australia on October 28, 2014. Venus is to the right of and slightly below Jupiter and Mars is to the right of and below Venus. The pre-dawn landscape is illuminated by moonlight. Credit and copyright: Joseph Brimacombe. 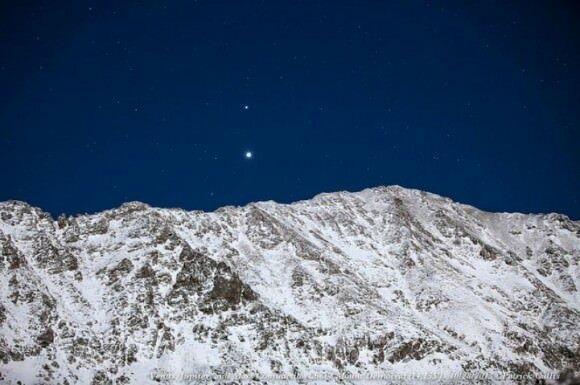 Jupiter, Venus, and Mars rise behind the 14,155 foot peak of Mount Democrat in Colorado. Credit and copyright: Patrick Cullis. Spooky Selfie, Three Planets and a Dead Satellite. The planetary conjunction of Jupiter, Venus and Mars on October 26, 2015, along with the ADEOS II satellite, which died in orbit in 2003 after the solar panels failed. Credit and copyright: Tom Wildoner. Le Puy-Saint-Bonnet in France on October 26, 2015. Credit and copyright: David de Cueves. Venus, Jupiter and Mars grace the morning skies in France on October 26, 2015. Credit and copyright: Frank Tyrlik. Venus, Jupiter & Mars create a close triangle in the eastern sky at dawn! John Chumack captured this image above his backyard Observatory in Dayton, Ohio on 10-26-2015. Credit and copyright: John Chumack. 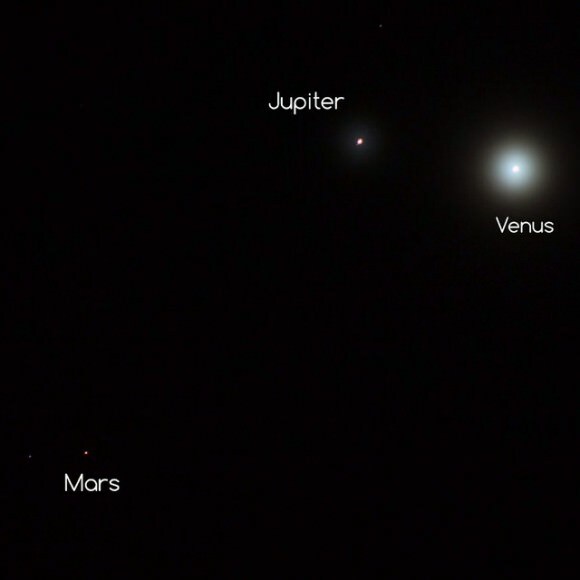 A zoomed out view of the planetary trio from John Chumack’s observatory in Dayton, Ohio on October 25, 2015. Credit and copyright: John Chumack. Conjunction of Venus, Jupiter & Mars on the morning of Monday Oct. 26, 2015. Credit and copyright: Holly Roberts. Jupiter and Venus conjunction on October 25, 2015. They were approximately with a degree and a half of each other. Jupiter’s moons are visible. Credit and copyright: Chris Lyons. Venus and the almost invisible Jupiter struggled to shine through the haze on the morning of October 25, 2015, as seen in Malaysia. Credit and copyright:Shahrin Ahmad. Venus, Jupiter and Mars in the hazy, cloudy morning skies over the UK on October 25, 2015. Credit and copyright: Sarah and Simon Fisher. A spooky planetary conjunction of Venus, Jupiter and Mars on October 10, 2015 on the Isle of Mull, Scotland. Credit and copyright: Shaun Reynold.